This colourful Nursery Swing is perfect for both indoor and outdoor play with your kid. Designed to be fun for your little one, this swing is sure to give both you and your child lots to giggle about! The plastic seat features moulded leg indents so that your child can sit comfortably in the swing. 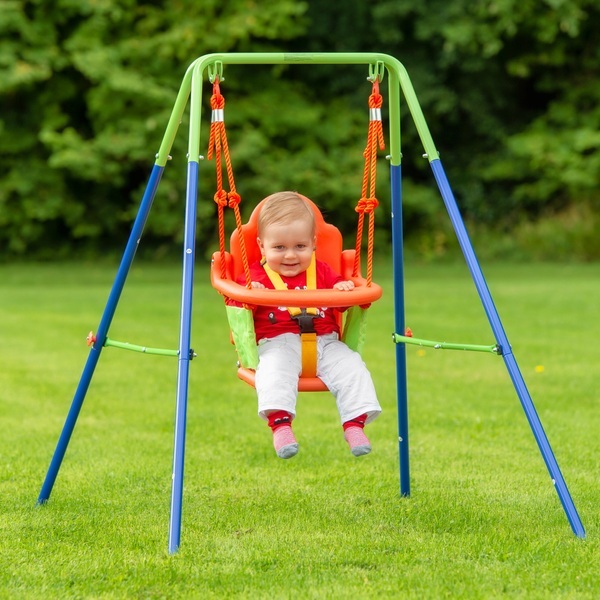 The Nursery Swing is packed with extra safety features to make absolutely certain that your child is protected as they play. The 3-point safety harness will keep your little one safe and secure. The harness is adjustable so it can adapt to fit your child comfortably. The high back on the Nursery Swing ensures that your little one is supported from head to seat, so they can swing safely. Soft mesh side panels between the seat and the safety bar keep this swing seat enclosed on three sides for maximum protection. The 4-point metal support frame is strong and durable to create a safe and secure swinging environment. With all these features to guarantee comfort, safety and fun, this Nurserywing is designed for optimal giggles, laughs and smiles from both you and your little one! The colours of the Nursery Swing may vary. EU Warning: Not for use by children under the age of 10 months.